I've become aware of several upcoming genealogy workshops, and suddenly it's seeming like a good idea to find out about my family tree. My Anglo-obsession has to come from somewhere, and with family names like Hopkins, Montgomery, Arnett and Kennard, I think it must be in the blood. 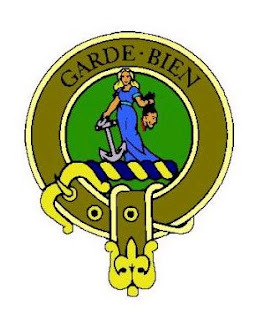 Speaking of blood, I was quite interested to find the Montgomery family crest pictured here, courtesy of the website Clan Montgomery Society International. I had always hoped to discover a family crest that I could display proudly, and what more could I have wished for than a prominently proffered severed head, complete with dripping blood? Oh, I tell you, it's a glorious day! I used ancestry.com to do family research myself last year. It is a good place to start. The site merges your details with other similar family trees and that is how you find more of your heritage. So far I have discovered that I am related to Edward I and Robert de Bruce, as well as George Washington. My family has been here since before we became a country, around 1500. Almost all of them settled in Virginia but I have been able to trace family back to exact spots in England and Scotland from which they came. Like you I always suspected my obsession was a result of the fact that I have British blood, I just couldn't confirm how strong it was. Happy hunting! oops, i misspoke. i traced my family to england in the 1500's. my american ancestors arrived at jamestown in the mid 1600's.